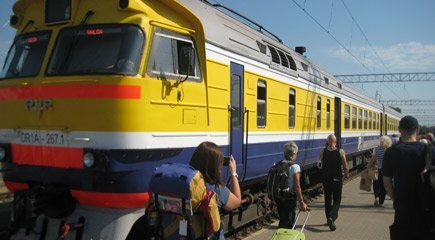 This page explains how to travel by train or ferry from Riga to other European cities. Click here to buy tickets starting in another city. Trains link Riga with many Latvian towns, including Daugavpils (4 trains daily, 3-4 hours), Krustpils, Lugaži, Tukums & Jelgava. The official Latvian Railways website is www.pv.lv. Click EN top right for English. A comfortable Tallink cruise ferry sails from Riga to Stockholm every day at 17:30, arriving at 10:30 next morning. The ferry has bars, restaurants, lounges, reclining seats or a range of shared or private cabins with en suite shower & toilet. To check sailing dates, times & fares see www.tallink.lv or www.tallink.se. Map of Riga showing ferry terminal. Step 1, travel to Tallinn as shown above. Step 2, take a ferry from Tallinn to Helsinki. A variety of ferry companies operate conventional ships (2½ hours) & fast ferries(1½ hours) from Tallinn to Helsinki. Services run daily. For times, fares & online tickets see www.tallinksilja.com, Eckero Line & Linda Line. Hopefully in a few years time the new Rail Baltica project will make this a routine journey by fast direct train. But in the meantime it is indeed possible to make this journey by train via Vilnius, if you want to avoid a lengthy journey in a long-distance bus. Step 1, travel from Riga to Vilnius, see the Riga to Vilnius page. Step 2, travel from Vilnius to Warsaw, see the Vilnius to Warsaw page. 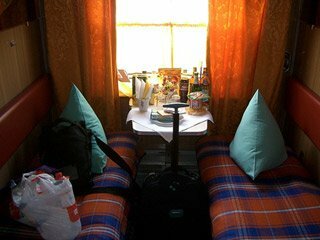 There is a comfortable and safe daily overnight sleeper train from Riga to St Petersburg, the Baltiya, with 2-berth and 4-berth sleepers. To check train times, see www.rzd.ru or use the Real Russia booking system. Fare: Riga to St Petersburg costs around €50 in a 4-bed sleeper if bought at the station. This train does NOT go through any part of Belarus. To check train times and book online in either direction, use the Real Russia booking system here. Real Russia charge a 15-23% mark-up over ticket office prices, included in the prices they show. For journeys starting in Riga you'll need to have tickets sent to you at a small extra charge as the e-ticket option doesn't work for departure from Vilnius, only for departures from St Petersburg. 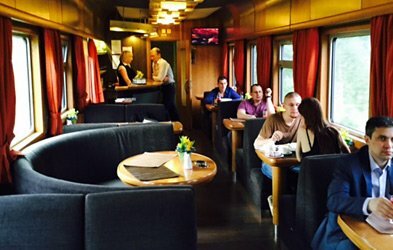 There is a comfortable and safe daily sleeper train from Riga to Moscow, the Latvijas Express, with 1st class 2-berth sleepers & 2nd class 4-berth sleepers. 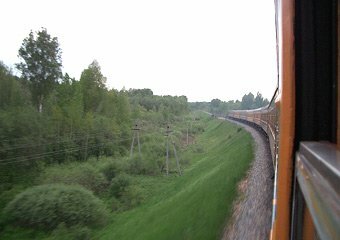 In summer there may be an additional daily sleeper train, the Jumala, leaving a little later. To check train times, see www.rzd.ru or use the Real Russia booking system. Fares: Riga to Moscow costs around €60 in a 4-bed sleeper if bought at the station. This train does NOT go through any part of Belarus. To check train times & book online in either direction, use the Real Russia booking system here. Real Russia charge a 15-23% mark-up over ticket office prices, included in the prices they show. For journeys starting in Riga you'll need to have tickets sent to you at a small extra charge as the e-ticket option doesn't work for departure from Vilnius, only for departures from Moscow. The Riga to Moscow Latvia Express boarding at Riga. Courtesy of DiscoverbyRail.com. Above left: A comfortable 2-berth sleeper on the Latvijas Ekspress Riga to Moscow train, with 2 lower bunks. Note the tablecloth, serviettes, and various goodies available for purchase. 4-berth sleepers are similar to 2-berth ones, but with two upper bunks as well. 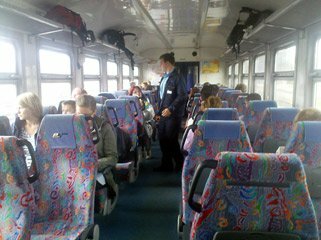 The Riga to St Petersburg train is similar. Above right: Through the countryside from Riga to Moscow Photos courtesy of John Walton. So civilised! 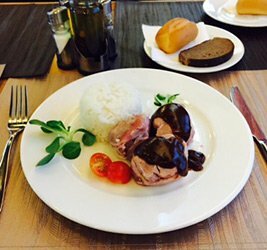 The Riga to Moscow train has an attractive restaurant car serving cheap but pretty good meals. Photos courtesy of Discoverbyrail.com. Step 1, take a ferry to Stockholm as explained above. and transfer by taxi, bus or metro to Stockholm Central station. Step 2, take a train from Stockholm Central to Oslo, Copenhagen, Gothenburg, Malmo or anywhere else in Sweden, Denmark or Norway. You'll find more detail on the Trains from Stockholm page. Step 1, travel from Riga to Warsaw as explained above. For Riga to London, see the London-Riga page as this covers travel in both directions.